We are now going to PUERTO RICO to build similar structures that are Hurricane proof and self sustainable. Earthship Biotecture partnered with Tagma, a small Uruguayan startup, to build Latin America’s first sustainable public school. With the help of 100 Academy students from 30 countries, the school was constructed in just a month. Materials were funded by sponsors and the local community pulled together to source all the repurposed items used in construction. The school has received international attention and sustainability awards. Plans are underway to build similar schools in every Latin American country starting with Argentina in 2018. The Easter Island Earthship music school was initiated by a pair of native Rapa Nui musicians, Mahani Teave and Enrique Icka who wanted to create a sustainable facility for local children to take lessons in both classical and traditional music. The small, isolated island can be a difficult environment for young people and so having a passion is key for keeping the kids out of trouble. With their NGO, Toki Rapa Nui, Mahani and Enrique raised funding for materials and systems and the Earthship Academy provided labor through its program, constructing the first three of eight classrooms during a one month session. Local builders continued on and the school was completed and inaugurated in 2016 and has received international visitors, traveling musicians and heads of state. The typhoon that hit the Philippines destroyed many homes with its strong winds. Michael Reynolds designed an new Earthship type to address this, the Windship. The building is earth-bermed and the vaulted concrete roof allows wind to pass over but not lift up the structure. This project was initiated and funded by Biotecture Planet Earth with help from trainees who paid to participate, helping to fund materials and expert guidance. You can check YouTube for daily videos recorded during this build. Construction of a community center in Malawi began in October 2013. Collaborating with Empower Malawi NGO, the Earthship Biotecture crew aimed to train, educate, and empower locals in implementing more sustainable building principles and lifestyles. Three rooms and a bathroom were completed during the crew’s first visit. In January 2015, the crew returned to Malawi to build 4 addition rooms and an additional bathroom with support from 35 local workers. The Earthship Community Center utilizes water catchment which is filtered for clean drinking water and black water waste management, previously inaccessible resources by the district as a whole. It currently houses a bank, nursery school, community hall, and a library. The construction of this Earthship began following the 2010 earthquake that devastated Haiti. Finished in July 2011, much of the building is made from repurposed materials, including rubble from the earthquake. The earthquake-resistant structure offers affordable off-grid power, clean water, and sanitation systems. This project facilitated training for dozens of locals in sustainable construction methods. 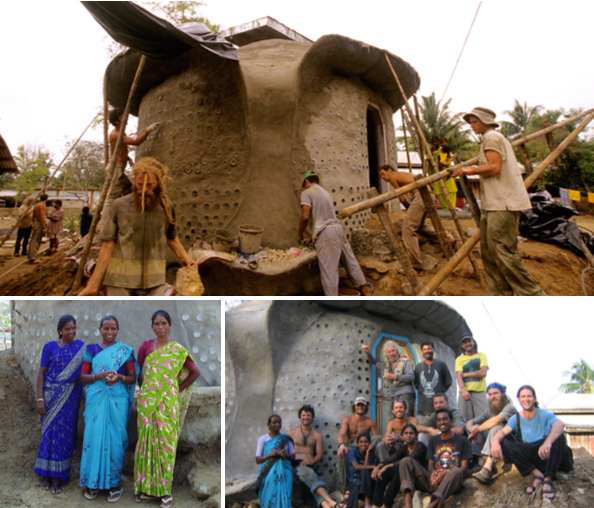 In October 2011, Michael Reynolds led a small team from Earthship Biotecture to Sierra Leone to begin construction of a Waldorf School for local children. The team was assisted by intern volunteers from around the world and by locals who learned how to replicate the design. The floor plan for this building was based on an 8 petaled flower. Each petal is a classroom. Over the course of two weeks, the team completed 2 of the classrooms. By December, the local crew had completed 2 more “petals” (classrooms). Michael Reynolds believes this to be the most successful Earthship Demonstration Project to date as the locals have been able to replicate the design and complete construction after the crew’s departure. This Earthship was built after a tsunami struck islands in the Bay of Bengal, contaminating local wells with sea water. In 2005, an eight person crew traveled to Little Andaman Island to construct a prototype using debris from the tsunami with a focus on collecting clean water while providing shelter. The Earthship catches and stores 2000 gallons of water, and contains a double roof for enhanced convection air circulation. Electric power is provided by solar panels while water and air conditioning demands are addressed with natural phenomena. This Earthship remains a community water temple. In 1999 construction began on an Earthship in Honduras in response to Hurricane Mitch. The “Hut” Earthship demonstrates hurricane-resistant building methods designed for warmer climates and smaller, more affordable projects. This structure was developed in conjunction with training for local professional builders in sustainable construction techniques. Earthship is currently working with bpe to complete a project in nepal next month! Biotecture Planet Earth, in conjunction with Earthship Biotecture, is partnering with Cuore Attivo and Campus CreaVista to build an Earthship for young teachers who will take life-improving sustainable technologies to schools in some of the economically poorest valleys of Nepal. From 16th November to 06th December 2017, Michael Reynolds’ experienced Earthship crew and a number of volunteers and local workers will be initiating the build of an education center for up to 16 young women who will learn sustainable technologies in order to then carry and spread that knowledge throughout remote schools in Nepal. The Earthship will expose the students to life-improving sustainable technologies that they will help spread to villages throughout the Makalu Valley. As teachers, they will play a key organizational role in educating their communities about the benefits of implementing simple sustainable technologies which will include: self contained toilets; water harvesting; offgrid power generation; the possibilities of building with reused materials; food production and the use of a biodigester for producing methane for cooking. The goal is to increase quality of life in terms of resilience, security and liberty and to avoid fragility and dependence on economic and political systems that can change without notice. Earthship Biotecture works with the non-profit Biotecture Planet Earth 501(c)(3) to fund and build humanitarian projects and educate local populations about the potential for sustainable technologies in their regions. Biotecture Planet Earth cooperated with Earthship Biotecture to build an off-grid, self-sustained home for a family living on Six Nations of the Grand River Territory, a First Nations Reservation in Canada, between 18 to 31 July of 2016. This particular family, headed by Flower, was in desperate need of a healthier and more cost effective shelter, as they have been living in a condemned trailer for years.